The Maroon Bells, near Aspen are purported to be Colorado’s most photographed vista, a state blessed with an embarrassment of scenic riches. Maroon Lake, at an elevation of 9,850′, is a liquid emerald, a worthy foil to the two fourteeners that serve as its backdrop, Maroon Peak and North Maroon Peak The Maroon Bells derive their name from their shape and color, being composed of mudstone, rather than the granite and limestone of other Rocky Mountains. My wife and I arrived at the Maroon Bells parking lot late morning, a sunny 60-degree mid-October day. The Bells wore a white mantle from autumn’s first significant snow. The threat of snow never completely retreats from the Rockies; it’s always waiting for the right combination of low pressure, a western freshet, and a cool northern cold front. After consulting the map, we agreed to hike the Maroon Lake trail without fishing, until we had reconnoitered the lake and creek first. Maroon Creek begins high in the peaks, divides into an east and west branch, the latter flowing into Maroon Lake, the east branch bypassing the lake. Skirting the lake’s shore, eventually we reached the point where West Maroon Creek enters Maroon lake. 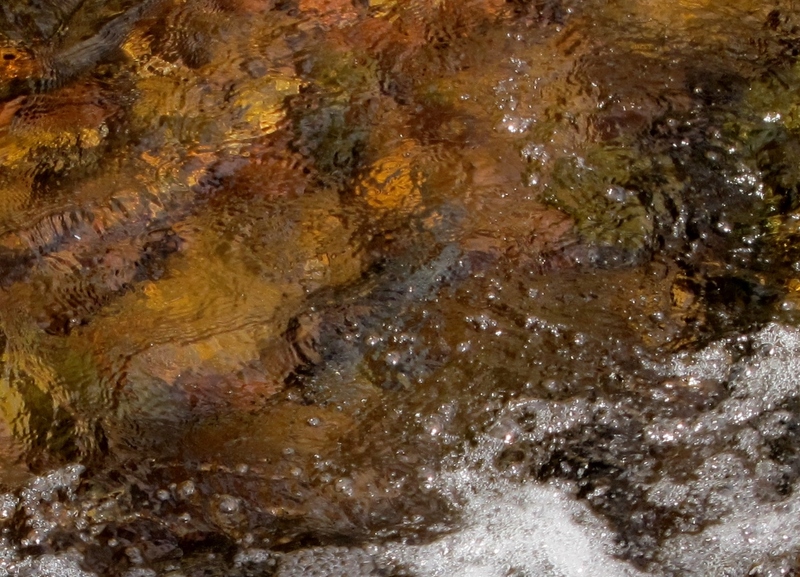 At this point, the stream is relatively wide , shallow and riffly, the banks lined with willow, alder, and river birch now resplendent in orange, yellow, and red, mimicking the colors of the streambed stones. Trout could be seen holding. Veering away from the lake, the path began climbing through an aspen forest, golden leaves made incendiary by the sun, trembling before the breeze, sounding like a distant wind chime. The creek, generally about fifteen feet wide, was steadily increasing in gradient now, its impatient water a pleasant cacophany, a celebration of the beginning of a long journey to the sea. Remnants of snow lay along the trail, protected by the shade of the aspens and spruce. Not far into the hike, I noticed a relatively large fish ensconced in a small boulder-pocket, no larger than a child’s snow saucer. Duly noted. After reaching the trail’s end, we hurriedly rigged our rods. My wife chose a King’s River Caddis for her five-weight and I an Elk Hair Caddis for my Iwana. Retracing our steps, casting to all the promising pockets, we were having little sucess at first. After a while, I reached the boulder-pocket described above. Approaching the stream carefully, I could see the trout still finning, facing upstream. Uncharacteristically, on the first cast, my Elk Hair Caddis was drawn to the small pocket as to a magnet. 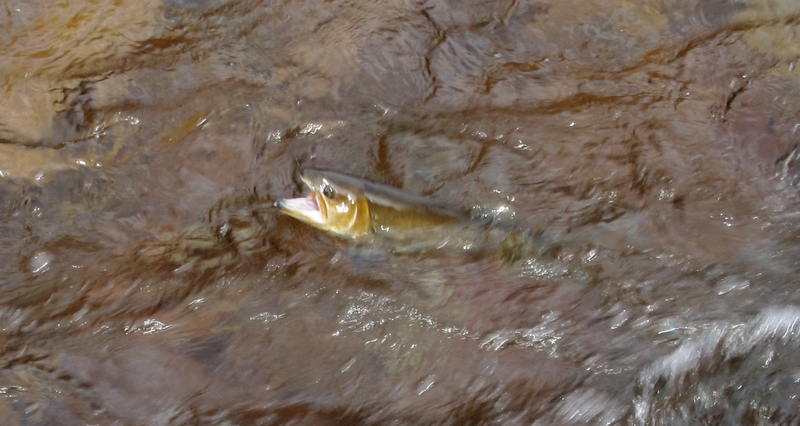 The trout took the fly, rising nonchalantly with open mouth. 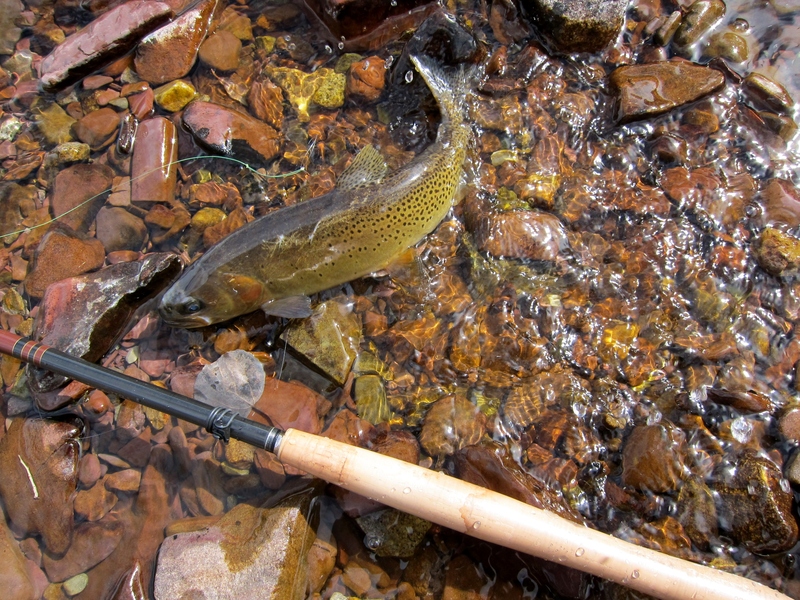 A spirited, several-minute skirmish ensued, the trout using the considerable current to his advantage, but the 5X held, the fish tired, and a beautiful 14″ cutthroat was brought to hand, its gill slashes a bright, hunter’s orange. 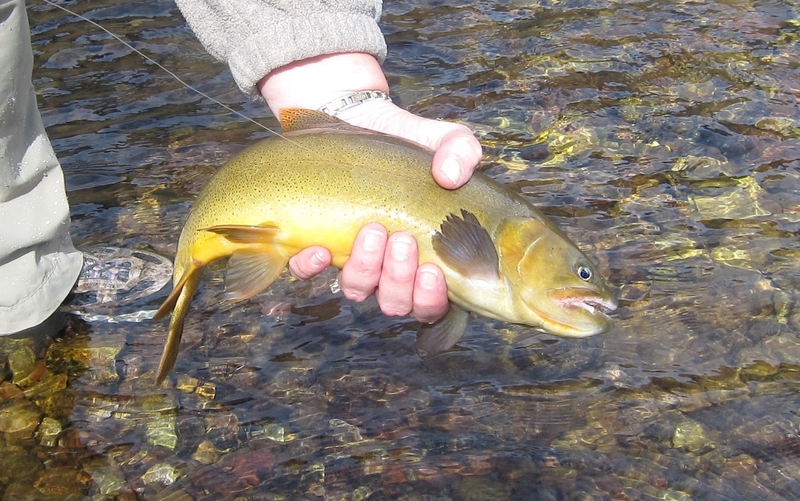 Continuing to fish downstream to the lake, a number of other cutthroats in the eight-to-twelve inch range were fooled . Abruptly, my angling reverie was interrupted by shouts of “I’ve hooked a big one!” A sixteen-inch cutthroat was attached to my wife’s five-weight, larger than any fish I caught that day. What a beautiful fish for this small stream, caught on the #16 King’s River Caddis, in view of an appreciative audience of other hikers. If you like the combination of awe-inspiring scenery, great fishing, and solitude astream, I would advise you to visit the Maroon Bells. 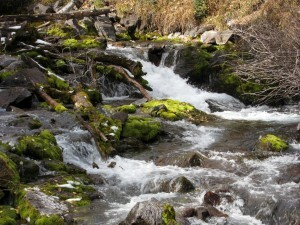 Next trip there, I plan to try the east branch of Maroon Creek, an equally appealing high-gradent freestone stream. Perhaps I’ll leave the wife at home.